12 year-old Henry York’s parents have been kidnapped. He is sent to live with his plain & boring Aunt Dottie and Uncle Frank in Henry, Kansas. He’s bored, disconnected and unemotional; simply an observer of life, never a participant. Yet, as we get to know Henry, we learn that he longs for connection, for family, for the simple pleasures in life (like baseball). As he settles into his attic bedroom and gets to know his 3 cousins and the farm on which he now lives, he starts to think maybe he can find something here he’s been missing – love and family. Then in the middle of the night, Henry wakes to find plaster bits on his face & bed. The ceiling and wall of his attic bedroom are crumbling away. He starts to chip and peel away the old plaster, only to discover 98 little cupboard doors. Mystified he and his adventurous cousin Henrietta start poking around the cupboards and in the farm house until they find a way to open the doors and unleash a series of curious adventures. It’s a creepy, curious adventure tale that I enjoyed, although it took me some time to get into the story. I think that was partly because Henry is so detached from his emotions and so cautious a boy that he tentatively steps into the adventure, slowly bringing the reader along. The glimpses into the other worlds that can be reached through the cupboards are enchanting and frightening – the next books in this series will hopefully explore more the geography and stories of all these magical lands. 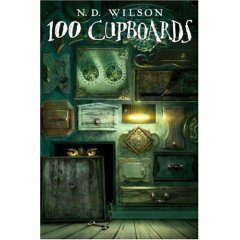 N.D. Wilson’s 100 Cupboards will be enjoyed by lovers of Neil Gaiman’s Coraline, as well as anyone who is searching for adventure or a place to belong.